The PS4 Pro can now play 4K video files | What Hi-Fi? Following an update to its Media Player app, the PS4 Pro can now play 4K files from a USB stick or from a media server. 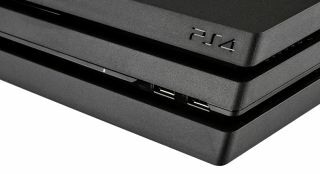 The PS4 Pro has had a rocky relationship with 4K video. Eyebrows were raised when Sony's newest PlayStation emerged without a 4K Blu-ray drive - leaving Microsoft's Xbox One S as a more thorough 4K offering on paper. And while it looks unlikely that Sony will change its mind about 4K discs anytime soon, the company has given the PS4 Pro a 4K boost with an update to the console's Media Player app. MORE: Did Sony just kill 4K Blu-ray with the PS4 Pro? The update means PS4 Pro owners will now be able to watch 4K video files in mp4 format stored on a USB stick or on a media server. Previously, 4K content on the PS4 Pro was restricted to streaming services such as Amazon Prime Video, Netflix and YouTube. The update will also bring 4K video support to the PlayStation VR, though any 4K files will be downsampled to the PS VR's 1080p resolution.